While it's been warming up here in Texas, for the past few days the skies have finally decided to open up and give us a much-needed downpour of rain. It's perfect timing too as the bluebonnets and other wildflowers have just begun to pop up, and now we'll likely get even more! When it rains, I always crave comfort foods like stews, chilis, and especially Mexican food. So, I decided to get my instant pot out today and make a delicious pot of green chile pork verde to sate my craving. I've made Pork Chile Verde before, but never in an electric pressure cooker. 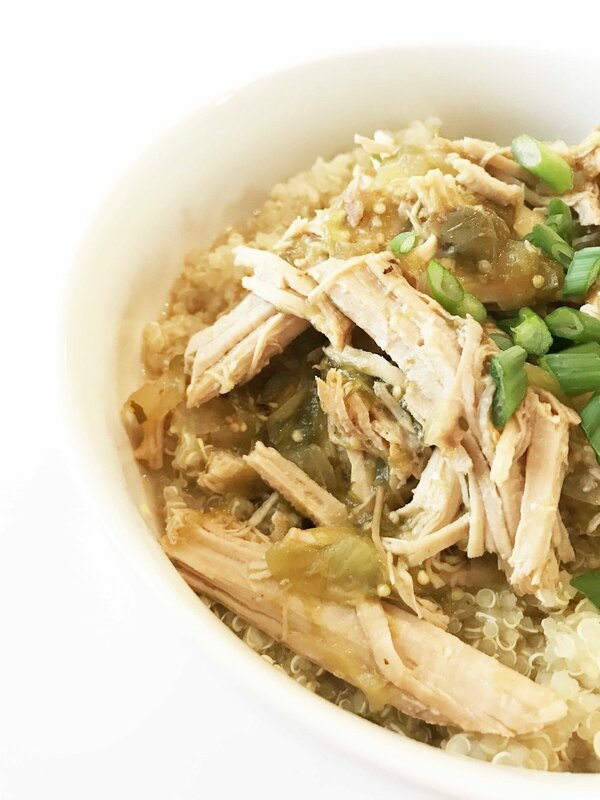 This Instant Pot version is definitely a 'shorthand' and quicker way to make a pork verde, with not only cooking fast but also using a few canned items for speed and ease. The end result is just as tasty! I also decided to cook the tenderloin in this verde whole, instead of cubing it up. But really, either way will work. Today I was just in more of a mood for shredded meat, and also didn't want to have to chop and cut any more than I had to. I guess I was in a 'lazy day' mode due to the rain? Sure. We'll blame it on that! I served my verde over some cooked quinoa, but rice would also work out nicely! There are a few optional choices below as far as finish off this pork. One option is for thickening the stew and the other is for a garnish. No matter which way you go, you can't go wrong with it! Place the 1/2 Tsp. Extra Virgin Olive Oil into the base of the instant pot and heat on the sauté setting. Once hot, carefully place the 1 1/4 Lbs. Pork Tenderloin into the pot and brown it on all sides and ends; turn the sauté feature off and remove the tenderloin to set aside. Add the 1 (28 Oz.) Can of Tomatillos, 1 (14 Oz.) Can Green Enchilada Sauce, 16 Oz. Verde Salsa, 1/2 C. Onion, 1 (4 Oz.) Can Diced Green Chiles, Garlic Clove, Minced, 1 Tsp. Cumin, 1 Tsp. Dried Oregano, and 1/2 Tsp. Sea Salt to the base of the instant pot and stir well to combine. Transfer the pork tenderloin back into the instant pot along with the verde mix. Seal the lid, set the valve to 'sealed', and put the instant pot on manual mode with high pressure for 75 minutes. At this point, you could serve it, or if you like a thicker consistency, whisk in the 1 Tbsp. Corn Starch and reseal the lid. Set the valve to 'venting' and cook via the slow cooker setting for about 30 minutes to let the verde thicken.